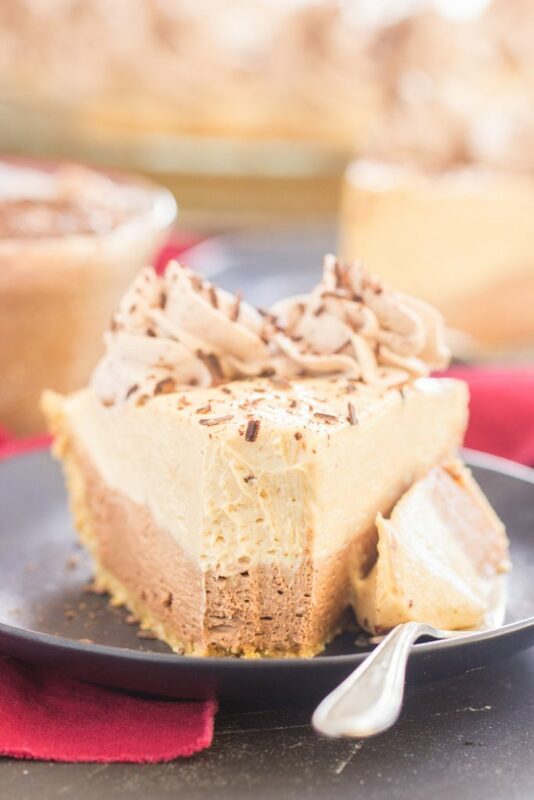 With a Nutter Butter cookie crust, a layer of no-bake chocolate cheesecake, and a layer of light, mousse-y, but rich peanut butter pie filling, this No Bake Chocolate Peanut Butter Pie recipe packs a punch, but it’s still quick and simple to prep! Hello, friends!! 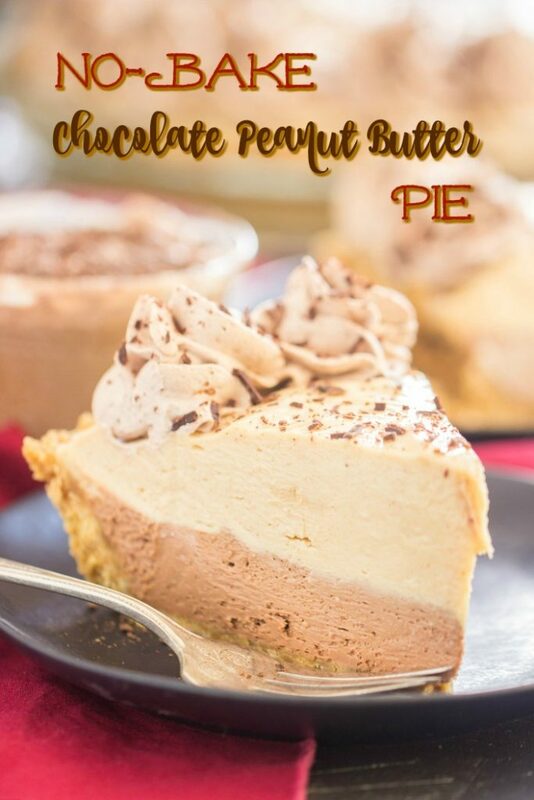 I have a new variation on my Gma’s No Bake Peanut Butter Pie recipe. It’s so inspiring and adaptable. 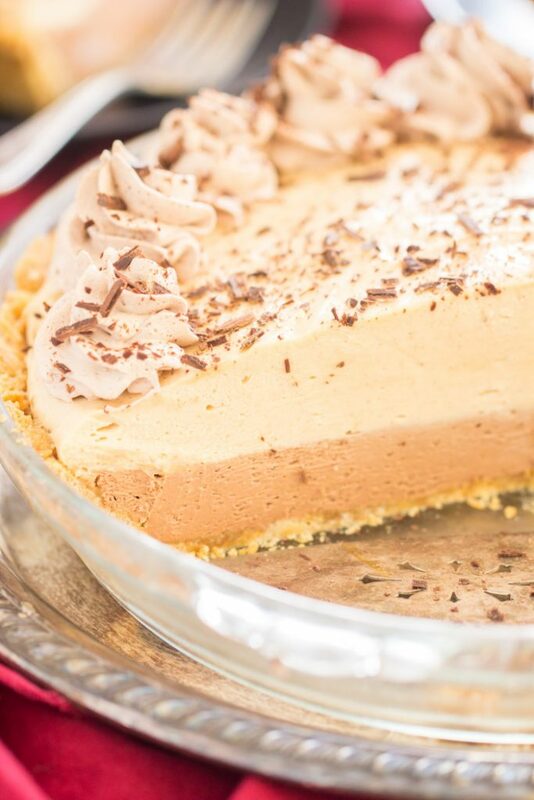 If you’re a peanut butter lover, that pie recipe is a must-try. 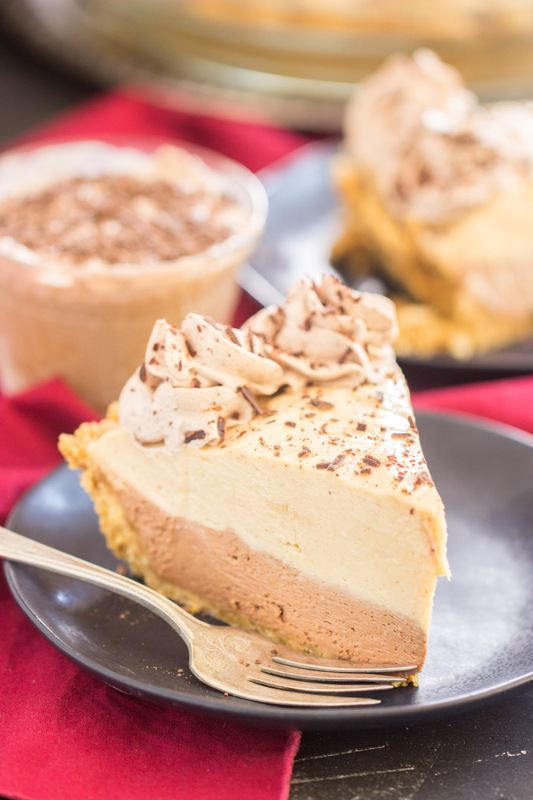 It’s rich, but light and mousse-y, loaded with peanut butter flavor, and you can prep it in about 10 minutes. 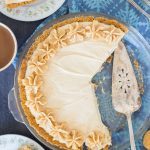 That peanut butter pie recipe is amazing and classic as-is, but it’s also an awesome canvas for creating other easy pie recipes. 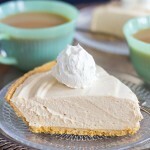 I would stop, but I love peanut butter, I love pie, and more importantly: you all seem to love new variations too. It’s delicious and simple, and who doesn’t need more recipes like that? Today I’m bringing you a No Bake Chocolate Peanut Butter Pie recipe – FINALLY some chocolate. 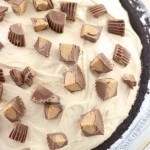 In my defense, I’ve made that peanut butter pie with Reese’s Cups before (see Reese’s Cup No Bake Peanut Butter Pie recipe and Peanut Butter Cup Fudge Pie), so it sort of had chocolate, but it was an unofficial ingredient. Now it’s an official ingredient. 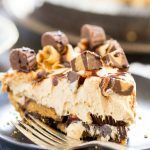 For this No Bake Chocolate Peanut Butter Pie recipe, I made a Nutter Butter crust (which I’ve also done in the Nutter Butter No Bake Peanut Butter Pie recipe). 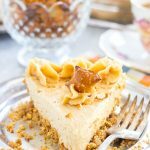 For the most part, I make my Grandma’s pie with a prepared shortbread or graham cracker crust for ease, but when I want to put in a little more effort, I typically make a crust with crushed Nutter Butter cookies. I’ve also made it with a pretzel crust though, and that’s pretty fun. Next up is a layer of no-bake chocolate cheesecake. 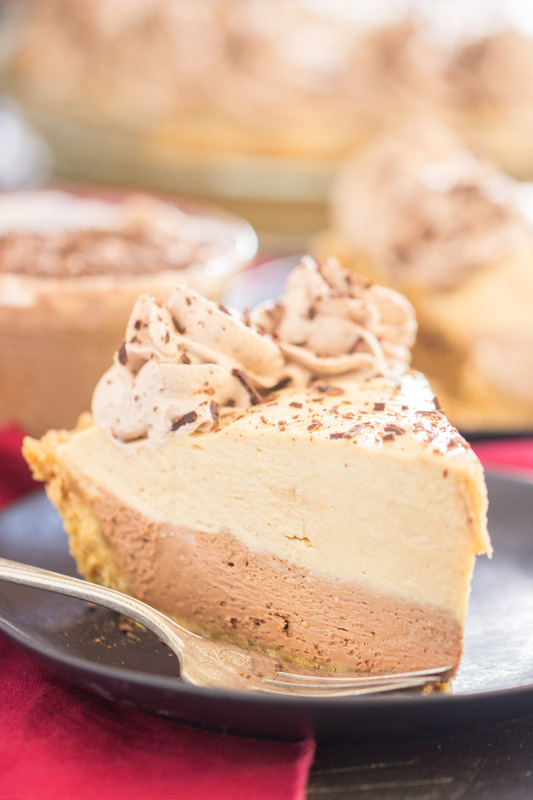 Not only do you get chocolate in this peanut butter pie, but you get cheesecake too! This is accomplished easily by adding melted semi-sweet chocolate to a no bake cheesecake batter. Super simple. Spread that chocolate cheesecake into the Nutter Butter crust, and boom, we’re off to the races in this No Bake Chocolate Peanut Butter Pie recipe. 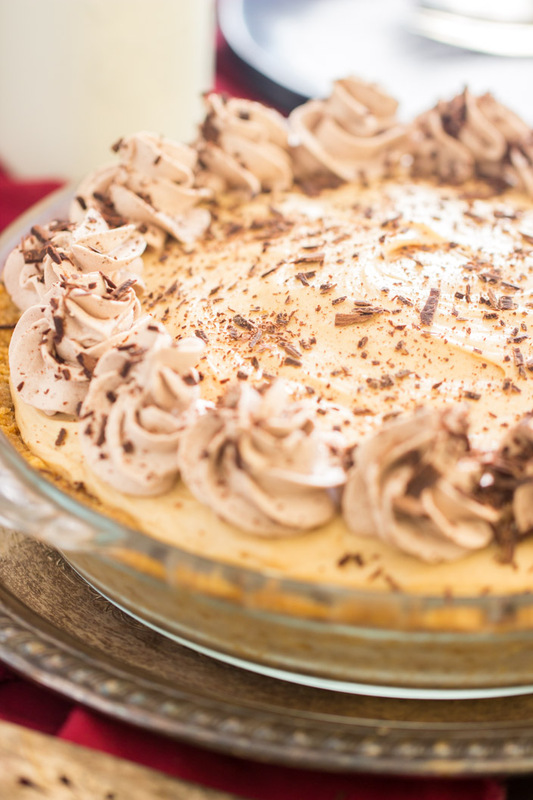 Last, but certainly not least, a layer of peanut butter pie filling from my Grandma’s classic pie. Rich, but light, and super peanut buttery. I actually included a bit of extra cream cheese in this layer too so that this pie has a cheesecake element to it. Altogether, there’s a lot of wonderful elements to a pie that is still super easy and quick to prepare! 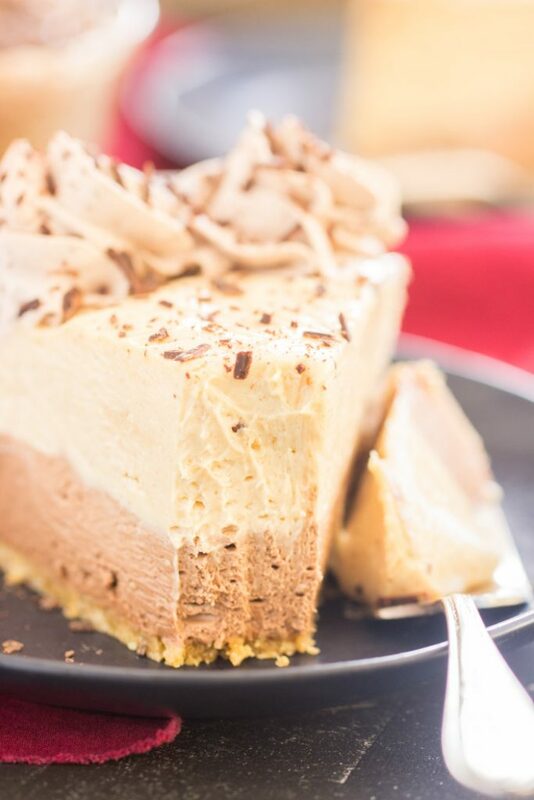 Top this No Bake Chocolate Peanut Butter Pie Recipe with whipped cream and a few chocolate curls, and you’ve got the best of chocolate and peanut butter in an easy dessert! God bless your Grandma for giving you all of these peanut butter inspirations! You have been making me stop and swoon ever since that PB ice cream. And that pistachio cake roll? Oh, that is to die for. You and I must be on the same taste-bud/flavor wave-length. Thanks for spoiling all of us. Hope your kitties are doing well. I can’t even say the name of this recipe without my watering. Oh my goodness is this delicious.